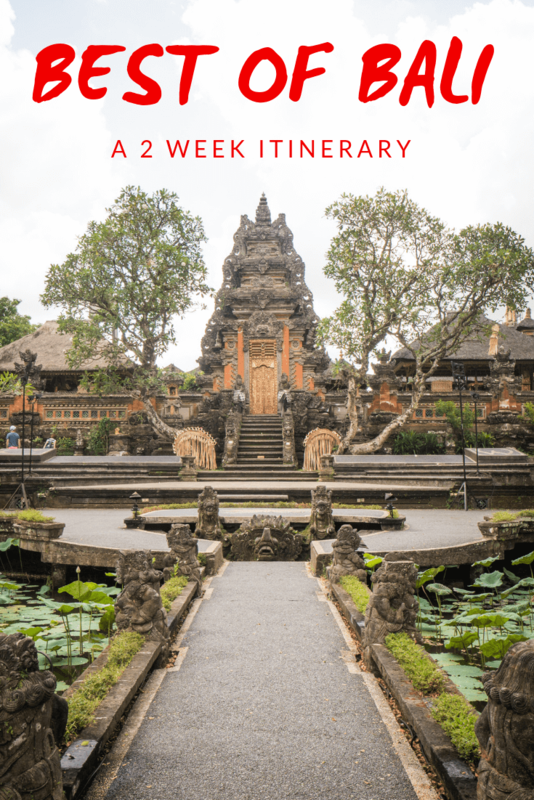 Home DestinationsAsia 2 Week Bali Itinerary: Best of Bali in Two Weeks! 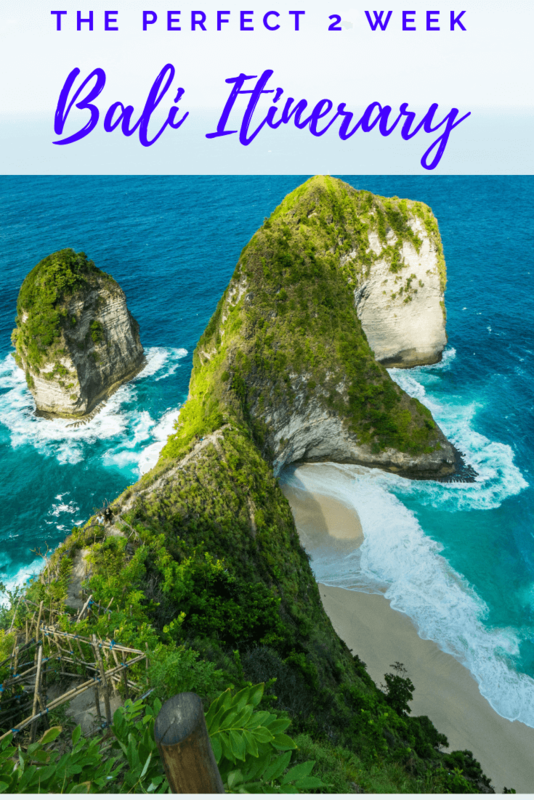 2 Week Bali Itinerary: Best of Bali in Two Weeks! The island of Bali is home to some of the most beautiful places in Indonesia, so it’s important to give a lot of thought to your travel itinerary. With so much to see, it’s hard not to miss out some amazing spots unless you spend hours and hours figuring out the best places to visit. The more places you read about, the more tempting it is to extend your Bali itinerary from 1 week to 2 weeks to 3 weeks to a month! We spent over 2 months exploring the island, which gave us the chance to figure out the best spots to visit. To save you figuring it out for yourself, we’ve come up with a detailed itinerary of Bali, going from Ubud to Canggu via the stunning Gili islands of Lombok. Follow the 2 week itinerary below to ensure you see the best of Bali! Make sure you have all the essentials for your trip with this guide of what to pack for Bali! It covers everything you need to turn a good trip into an amazing one! Your flight will arrive into Bali’s Ngurah Rai International Airport in Denpasar. It’s important to check in advance if you require a visa, but fortunately citizens of most countries receive a free visa on arrival in Indonesia. As soon as you clear customs and reach the arrivals section of the airport you will see a crowd of taxi drivers. They will shout to get your attention and approach you to offer their services to you. Despite what they say, they won’t give you a good price and will try to charge an extortionate amount of money. The easiest way to avoid being overcharged is to pre-arrange a taxi to pick you up. 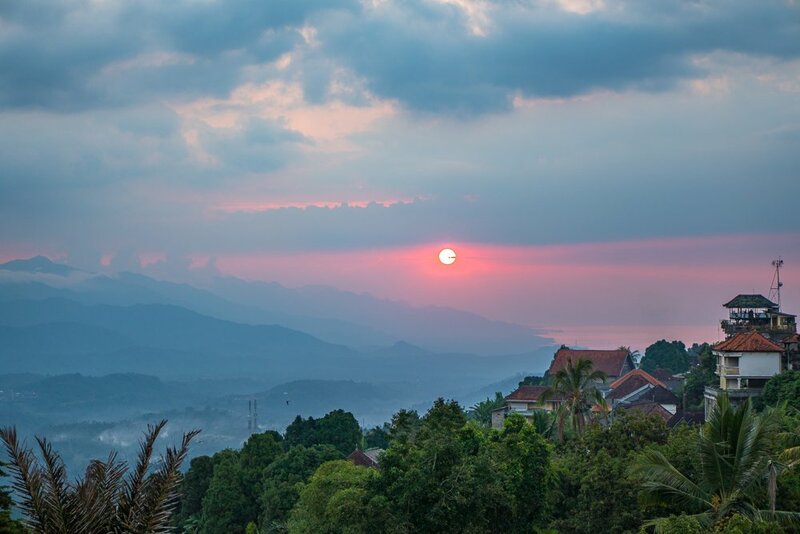 If you’re looking for a hassle free start to your trip then pre-booking a taxi through your accommodation is one of our top tips for travelling Bali. It should cost around 300,000 Rupiah (IDR) from Denpasar airport to Ubud. If you’re arriving at night it’s even more important to pre-book through your accommodation as they will know the property’s exact location. There are too many hotels in Ubud for taxi drivers to know, so if you don’t pre-book it’s likely that your driver will struggle to find your accommodation quickly. The alternative is to order a Grab – the equivalent of Uber in Indonesia. Travelling to Ubud by Grab should be cheaper, but getting a Grab taxi from Denpasar airport can be problematic! It should take between 1-2 hours to get to your accommodation in Ubud. By the time you’re settled in to your hotel there probably won’t be too much time left of the day. If there is some time enjoy a wander through the Ubud market in search of a bargain. When you’re ready for dinner we strongly recommend heading to Warung Krisna. This small restaurant serves up some of the best Balinese food we had in Ubud – with the Mie Goreng and Nasi Campur being particularly tasty! The next day is your first chance to explore the sights of Ubud. To do this you will need to either hire a taxi driver for the day or rent a scooter/bike. Expect to pay around 500,000-600,000 Rupiah for a full day trip around Ubud by taxi, but be prepared to negotiate to get a better deal. If you want to rent a scooter/bike, this should cost around 60,000 Rupiah per day. Although it’s common for tourists to ride without a license in Bali, it is a risky thing to do. If you’re in an accident your travel insurance won’t cover you if you don’t have a proper license, so only ride without one if you are extremely confident and aware of the risks. There are some incredible places to visit in the area surrounding Ubud. One spot that simply should not be missed is the wonderful Tegalalang rice terraces – one of the most beautiful places in Bali. There are a number of pathways to walk through and admire the wonderfully green rice paddies. The rice terraces at Tegalalang are beautifully carved into the countryside and can also be admired from one of the many restaurants overlooking the rice paddies. 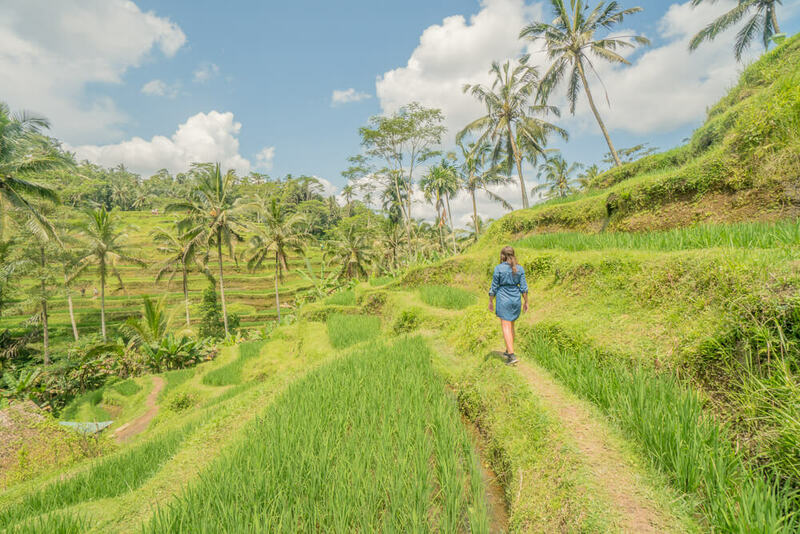 Entrance to the rice terraces costs 10,000 Rupiah per person, although to walk on certain paths through the terraces there are mandatory ‘donations’ so bring some extra cash with you to cover this cost. 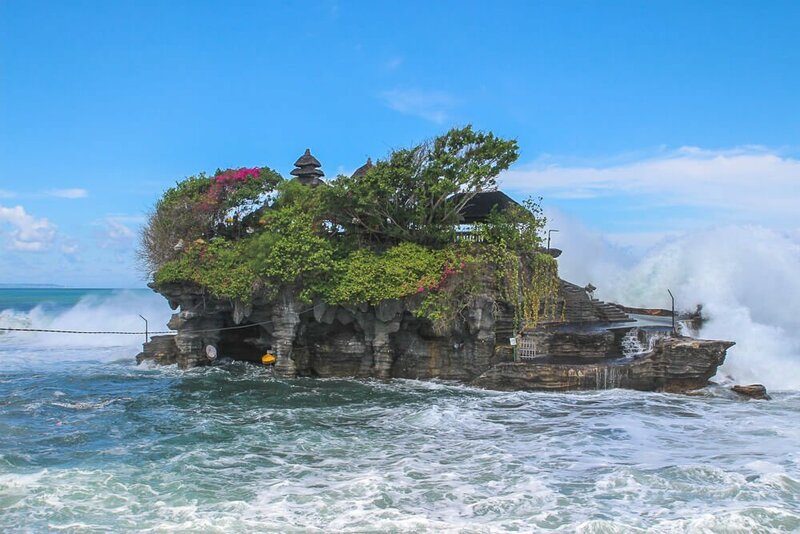 You will need to decide what other places to visit on your day trip from Ubud, with some options being Tukad Cepung waterfall, Kanto Lampo waterfall, Gunung Kawi temple, Goa Gajah temple and Tirta Empul water temple. Personally, we recommend including both Tukad Cepung and Kanto Lampo as they are 2 of the best waterfalls near Ubud. 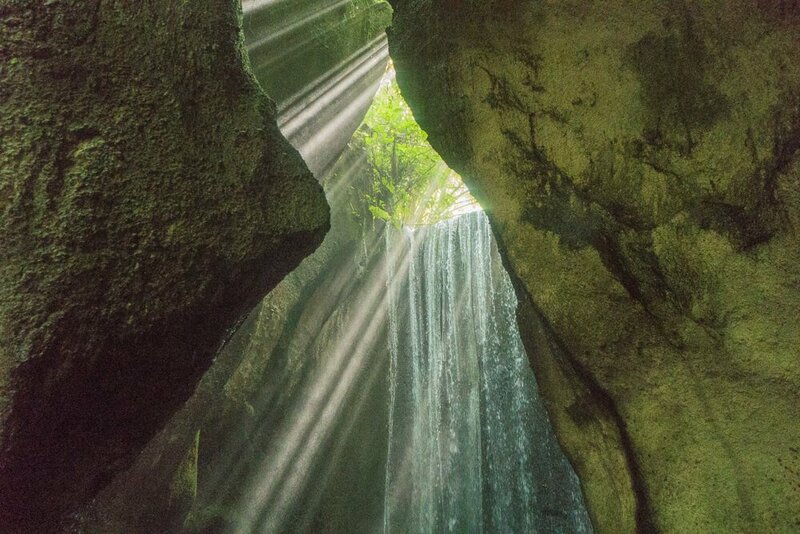 Tukad Cepung waterfall is inside a cave and is particularly beautiful thanks to the rays of light that shine in from above. 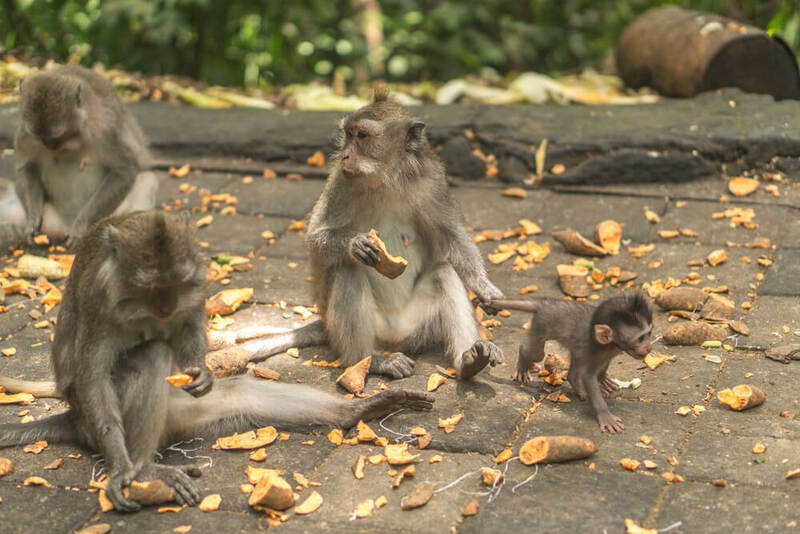 Ubud is well known for its sacred monkey forest, which is another great spot to add to your day out. The forest is home to over 700 playful monkeys and so it’s a great place to visit. It’s hard not to have fun watching the monkeys get up to mischief! To visit the forest there is an entrance fee of 50,000 Rupiah per person. As there is only so much you can fit into a day you will need to prioritise what you want to do. Alternatively, you can always add an extra day to your Bali itinerary so you can fit in more sightseeing around Ubud! Wherever you decide to visit, you’re sure to have a great day out. When you get back to Ubud you’re likely to be pretty hungry after a day of exploring. Ayam Yummy is one of our other favourite places to eat in Ubud, so either head there or find another spot that takes your fancy. After you’ve finished, head over to Mingle to enjoy 2 for 1 cocktails during their happy hour. It’s an early start the following day though; so don’t go overboard on the drinks and make sure to get an early night! You’ll need to wake up early the next day and be ready to be picked up at around 2am to climb Mount Batur. Tours to Mount Batur from Ubud can easily be arranged through a travel agent or at your accommodation. Prices start at around 300,000 Rupiah per person but can vary quite dramatically so shop around to get a good deal. It takes around one hour to reach Mt Batur from Ubud, at which point it’s time to begin the hike. The hike itself isn’t too difficult but as you’d expect involves a lot of uphill walking, so prepare for a legs workout! 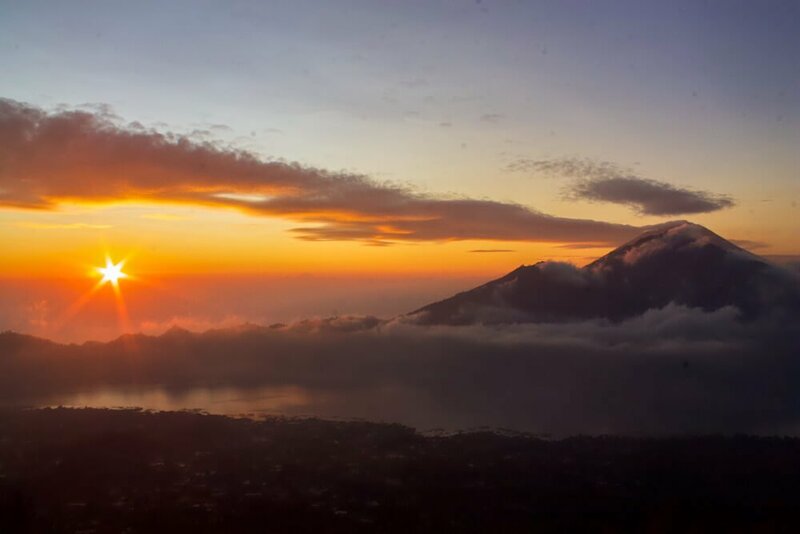 It only takes around an hour and a half to reach the summit of Mount Batur, which is a brilliant viewpoint for watching sunrise over Mount Agung. It’s a truly incredible sight and will be one of the most unforgettable moments of your Bali trip! If you don’t feel like hiking Mount Batur then there are plenty of other things to do in Ubud. One option is to take a day trip to see places you didn’t get chance to on the previous day. 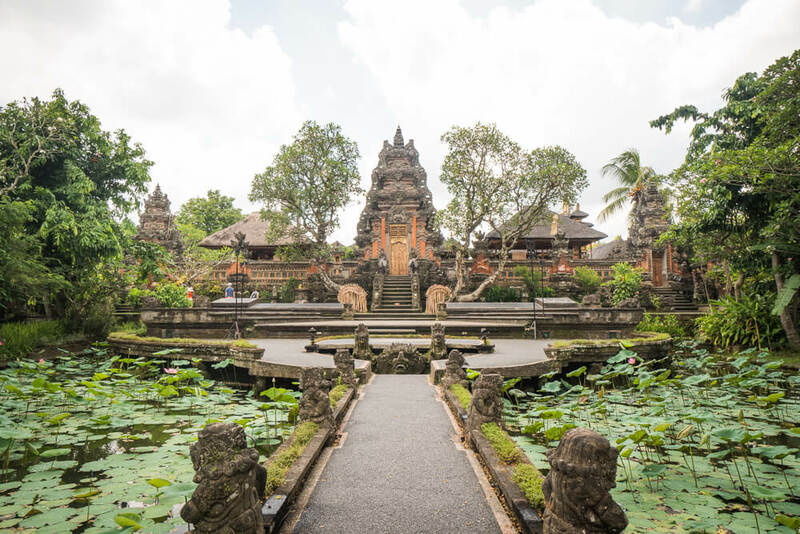 Alternatively you can wander through the town to visit the beautiful Pura Taman Saraswati temple and Ubud Palace as well as revisit Ubud Market. Whatever you do, we recommend heading back for drinks at Mingle again in the evening for your last night in Ubud! 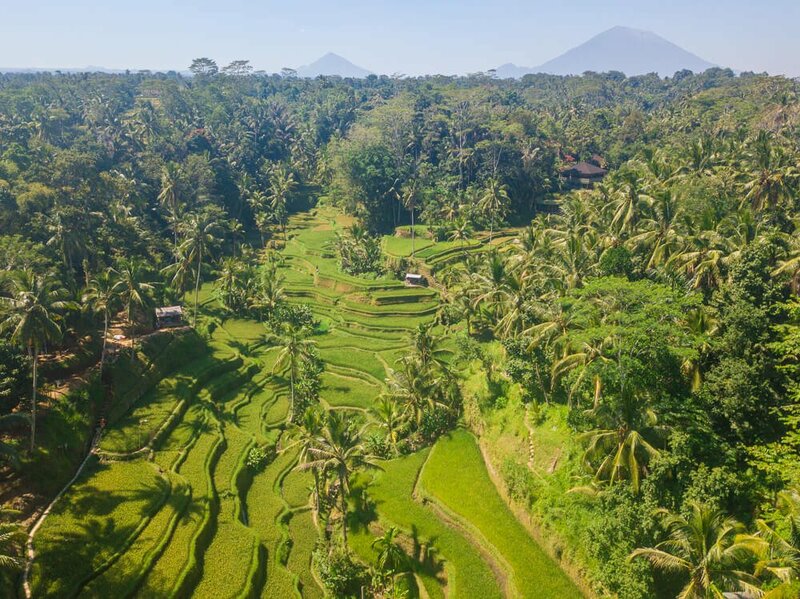 If you’re looking for more information about what to do in Ubud then click here to read our Ubud guide! Rama House is the perfect budget option in Ubud. Located on the same street as Ubud market, the property is just a short walk from Mingle – a great spot for happy hour drinks! A double room with air con and breakfast included costs around $18 USD (256,000 Rupiah) per night, which is great value for such a brilliant location! Click here to see the latest prices at Rama House for your trip! The beautiful Plataran Ubud Hotel and Spa is a truly beautiful property just a 20-minute walk from the centre of Ubud. Boasting 2 swimming pools, the property is perfect if you’re looking for somewhere to relax during some downtime. Rooms start from around $144 USD (2,046,000 Rupiah) per night, with discounted rates often found on Agoda. Click here to see the latest prices at Plataran Ubud Hotel and Spa! Komeneka at Bisma is the perfect property for a luxurious stay in Ubud. The property is in a secluded location with beautiful jungle views despite being just a 10 minute walk from the main street. With 2 swimming pools and a relaxing spa on site, it’s a great place if you’re looking to unwind. Prices for a lavish stay at the Komenkea at Bisma start at around $308 USD (4,375,000 Rupiah) per night. Click here to see the latest prices at Komeneka at Bisma! There are 2 options for getting to Munduk from Ubud – either take a shuttle bus or a taxi. The shuttle bus should cost 150,000 Rupiah per person, although these generally only run if there are enough other people travelling on the route. A taxi from Ubud to Munduk should cost around 400,000 Rupiah, so make sure to negotiate a good price. As you want to arrive in Munduk as early as possible, going by taxi is a better option as you can leave as early as you want! Whatever option you choose, the journey should take around 2 hours. 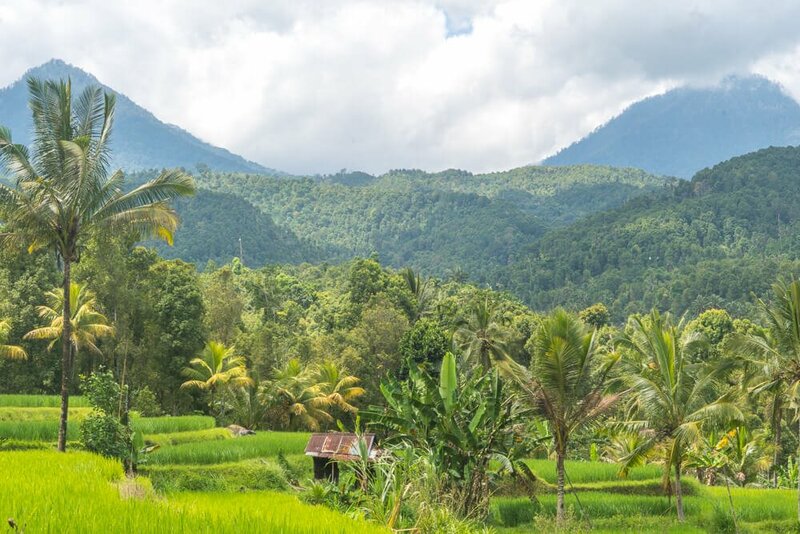 The small village of Munduk is a brilliant place for nature lovers and is one of the less visited spots in Bali. Found in the Central highlands, the village is surrounded by mountains and beautiful green countryside. There aren’t too many things to do in Munduk itself, but one thing you simply cannot miss is the Munduk waterfall trek. As you are leaving Ubud early you should arrive in time to do the trek on your first day. The trek takes about 3-4 hours in total and leads you through the jungle to 3 different waterfalls. 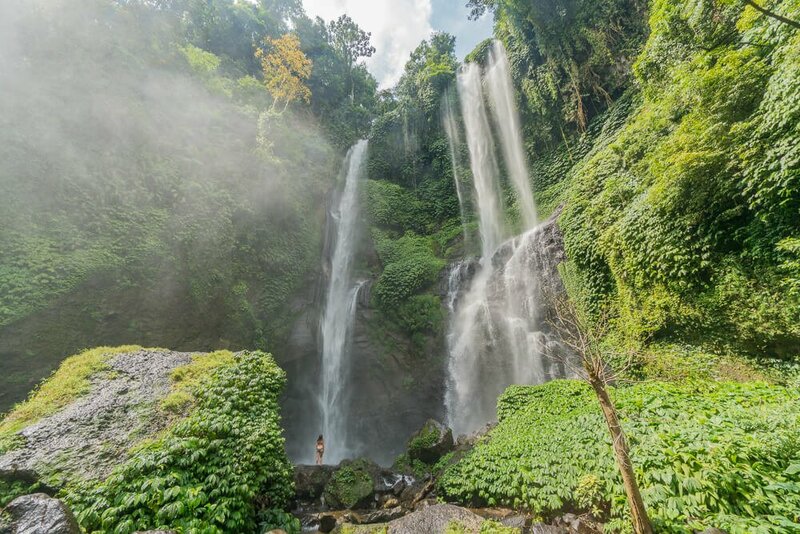 Fortunately, the waterfalls aren’t too busy, as most tourists don’t visit this part of Bali! 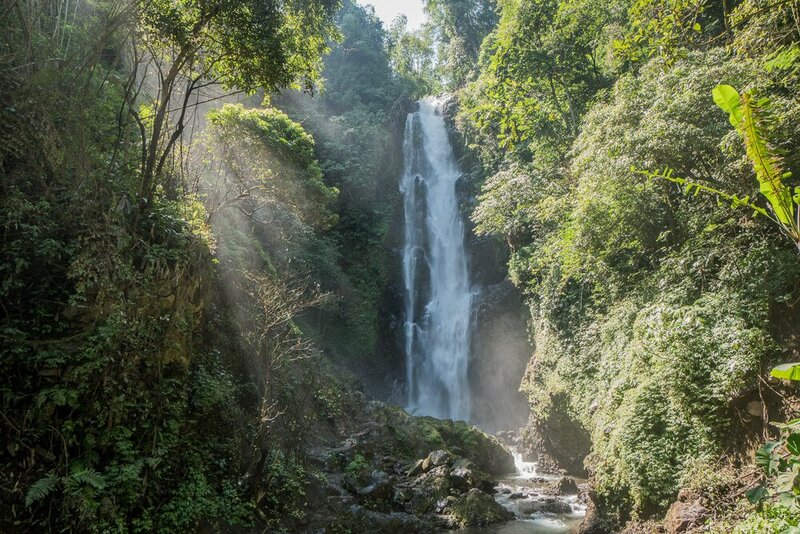 We recommend reading our guide to the Munduk waterfall trek so you know exactly where you’re going before setting off! After finishing the trek, make your way to Warung Classic for the best view of sunset in Munduk. Enjoy a few drinks as you watch the colours light up the sky. While Warung Classic do serve food, we personally would recommend visiting Warung Made for dinner. Warung Made offers brilliant Balinese food at a good price and the owners are lovely people! The next day take a day trip around North Bali to visit beautiful waterfalls and a beautiful temple. As Munduk is such a small village there aren’t really taxis just waiting around to take people on tours. The best way to arrange a taxi is to either ask at Warung Made or pre-arrange one via email/whatsapp. We recommend using the Lovina based 007 transport Bali as they are close enough by to take you on a day trip. A day trip from Munduk is likely to cost around 500,000-600,000 Rupiah, but make sure to negotiate to try and get the best possible price. Set off early and head straight for Sekumpul waterfall, which should take about an hour to reach from Munduk. To get to Sekumpul waterfall you’ll have to hike down a relatively steep path, but it is quite easily manageable. Surrounded by forest and standing at 80 metres tall, Sekumpul is a wonderful spot to visit and shouldn’t be missed off your Bali itinerary! Visiting Sekumpul will take around 3 hours in total – including hiking down and back up, as well as enjoying the view once you reach the falls. Once you’ve made it back up to the car park, you’ll want to head for Pura Ulun Danu Beratan Temple. Pura Ulun Danu Beratan Temple is one of the most famous temples in Bali due to its picturesque location on the shore of Lake Beratan. The peaceful location makes it a lovely place to visit, despite the fact you can’t actually go inside the temple. Next up is a visit to the stunning Banyumala twin waterfall. Currently this waterfall isn’t as visited as some of the others in Bali due to the poor road condition. While this is a problem for those riding a scooter/bike, it’s completely safe to visit by car. Fortunately the walk to the falls isn’t as strenuous as at Sekumpul, although it is still downhill. It only takes around 20 minutes to walk down to the falls and you can reward yourself with a dip in the refreshing water. If you’re lucky you may end up having this wonderful waterfall all to yourself as most tourists aren’t aware of its existence. We only saw 2 other people during our time at the falls, which meant we could enjoy the beautiful nature in peace. Other potential inclusions on a day trip if you have time are Gitgit waterfall, Aling-Aling waterfall and the Jatiluwih Rice Terraces. We personally weren’t too impressed with Gitgit waterfall so would recommend prioritising either Aling-Aling or the Jatiluwih Rice Terraces if you want to add in another stop. Aling-Aling waterfall is a great spot for adventure lovers as you can slide down and jump off waterfalls. The Jatiluwih Rice Terraces are a beautiful spot to visit thanks to the beautifully green rice terraces that stretch far and wide. Once you arrive back to Munduk you’re bound to be tired and the sun may have already set. Head out for dinner at Warung Made and enjoy a drink or two before calling it a night! Adila Warung and Homestay is a great budget option in Munduk. Not only does the property have fantastic mountain views, but it also has a swimming pool – which is insanely good value considering the price! Rooms start from around $19 USD (290,000 Rupiah), with breakfast included! Click here to book a great value stay at Adila Warung and Homestay! Although Swar Bali Resort is a 20-30 minute walk from Munduk Village, it’s extremely good value for money. The property is relatively luxurious in comparison to other mid-range options in the area. It’s a great option if you’re looking for a room with a fan too, as most properties in Munduk don’t have fans or air con due to the cooler climate. Personally, we found the fan a bit of a life saver as it was still very hot during our visit. Rooms start at $34 USD (521,000 Rupiah) per night, with breakfast included in the price. Click here to see the latest prices at the Swar Bali Resort! Munduk Moding Plantation is by far the more luxurious place to stay in Munduk. The property boasts one of the best infinity pools in Bali, with stunning views of the surrounding countryside. Rooms at the property are luxurious and perfect for a comfortable stay. Prices for a stay at the Munduk Moding Plantation start at $155 USD (2,351,000 Rupiah) per night. Click here to see the latest prices for a stay at the beautiful Munduk Moding Plantation! 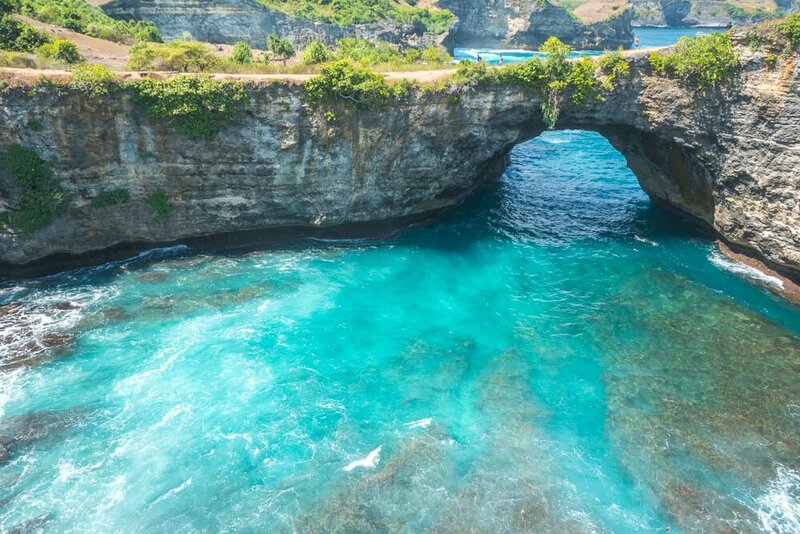 The beautiful island of Nusa Penida is home to a number of stunning natural attractions like Kelingking beach, which make it an essential stop for your Bali itinerary. Perhaps surprisingly, most people only visit the island on a day trip, which inevitably involves missing out some incredible places. With so much to see and do it’s a much better option to spend a few days properly exploring everything this wonderful island has to offer! To get to Nusa Penida from Munduk you need to take a taxi to Sanur. Your best bet is to arrange a taxi the night before so that you can negotiate a fair price with the driver. Once you reach Sanur you can take the short ferry ride over to Nusa Penida. It’s best to know what ferry you plan to get in advance so that you can make sure your taxi driver gets you there around 20-30 minutes early. Click here to book your ferry to Nusa Penida in advance! The journey from Munduk to Sanur takes around 3-4 hours, and should cost around 600,000 Rupiah by taxi. Once your ferry departs from Sanur it should take around 30-45 minutes to get to Nusa Penida. Your accommodation should be able to arrange transport from the port, and in some cases this is included in the price of your stay. There aren’t too many taxis at the harbour, so it’s important to contact your accommodation to arrange your pick up in advance. By the time you arrive it’s likely to be late afternoon, so spend the rest of the day relaxing. Find somewhere close to your accommodation to eat and take it easy as there’s plenty of exploring to do the next day! If you’re staying in Ped Village, we recommend heading to Penida Colada – a lovely place to watch sunset over Mount Agung over dinner and drinks. Before heading to bed it’s important to arrange a taxi driver for the following day. Although it’s cheaper to rent a scooter/bike to travel around the island, the roads to the main attractions are unpaved and extremely unsafe even for experienced riders. In the interest of safety we recommend paying the extra for a taxi driver. You should be able to find a driver either online or through your accommodation. Organise a tour around the west side of the island, which should cost around 500,000 Rupiah. Be prepared to negotiate as drivers normally quote high prices to begin with! Wake up early to meet your driver and ask them to make Kelingking beach your first stop. Kelingking beach is the most famous attraction on Nusa Penida, so it’s best to get there early to try and avoid the crowds. We recommend arriving between 8am and 9am, so don’t have too many drinks the night before! Found in a small cove, this stunning white sand beach is a glorious sight thanks to the backdrop of towering cliffs shaped almost perfectly like a roaring T-Rex. It’s such a breath-taking sight that it’s hard to drag yourself away from the numerous viewpoints overlooking the picturesque beach. There are plenty of different vantage points, so make sure not to miss any! If you actually want to go down to Kelingking beach itself then the only way is via a steep pathway made of dirt and rocks. As it’s a tough path to navigate it takes around 45 minutes going down and an hour coming back up. The beach is a beautiful spot to enjoy, although there are some extremely strong currents in the area so it’s safer not to swim. Most visitors don’t actually go down to the beach due to the poor path condition, so you won’t have to share it with too many others! Once you’ve finished up at Kelingking beach, your next stop should be Angel’s Billabong – a wonderful natural pool. The positioning of the pool on a cliff edge means it’s effectively nature’s version of an infinity pool. During high tide, waves regularly send water powering over the cliff and into the pool. If you’re caught in the pool at this time you can easily be thrown against the rocks and dragged over the edge to sea. Even at low tide waves can be unpredictable, so swimming in the pool isn’t advisable. Despite that, it’s still a wonderful place to visit. The forceful waves at high tide are brilliant to watch as they send water crashing into the pool before forming a temporary waterfall as it makes its way back to sea. 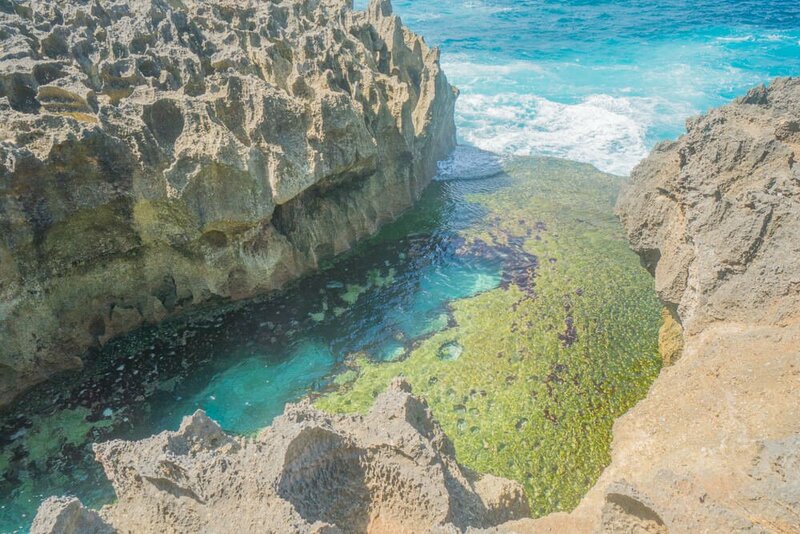 Just a short walk from Angel’s Billabong is the picturesque Broken beach. Unfortunately you can’t actually access the beach, but it is still a lovely spot to visit. The beach takes its name from the archway in the cliffs that allows seawater to flow in and out of the small cove. The final stop of the day should be Crystal bay. It’s a pleasant spot to enjoy the remainder of your day whether you want to soak up the sun or go snorkelling. Thankfully, it’s a lot easier to access than some of the other beaches on the island, so you won’t have to endure a steep descent by foot to get there! By the end of the day you’re bound to be pretty tired out, so find a nice spot for dinner before calling it a night. You should also decide what you want to do the following day. 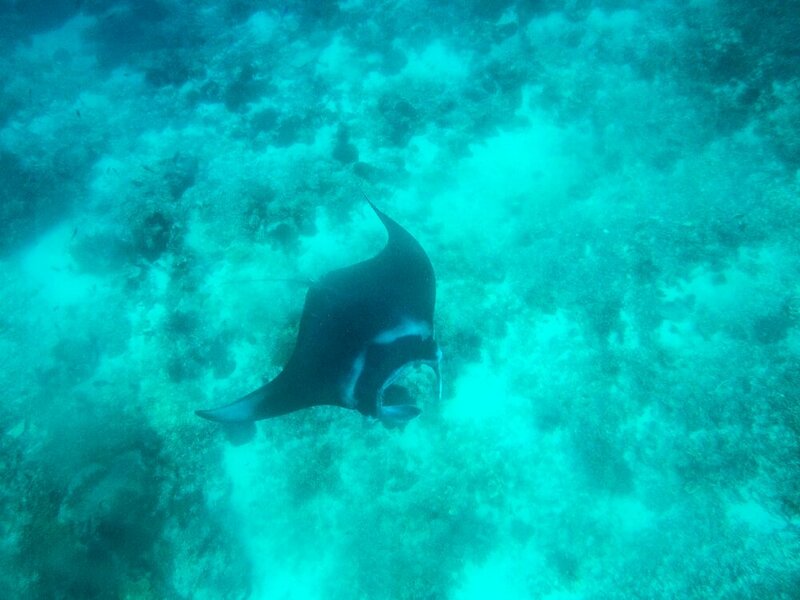 The best options are to either go on a tour of the east side of the island or go snorkelling with manta rays. Whatever you opt for, your accommodation should be able to assist you in booking it. Personally, our recommendation is to go on a snorkelling tour as Nusa Penida is one of the best places in Bali for snorkelling and diving. Snorkelling tours start from around 150,000 Rupiah per person and visit different points around the island with popular stops being Manta point, the underwater Buddha temple and Crystal bay. Manta rays are truly incredible creatures to witness in the wild and seeing them is a wonderful experience that you won’t forget any time soon. The current in the area can be quite strong, but as long as you’re a confident swimmer you’ll be fine. If you’re a qualified diver you can always opt for a dive trip instead of a snorkelling tour. The other option is to take a trip around the east side of the island to visit the Thousand Island viewpoint and Atuh beach. 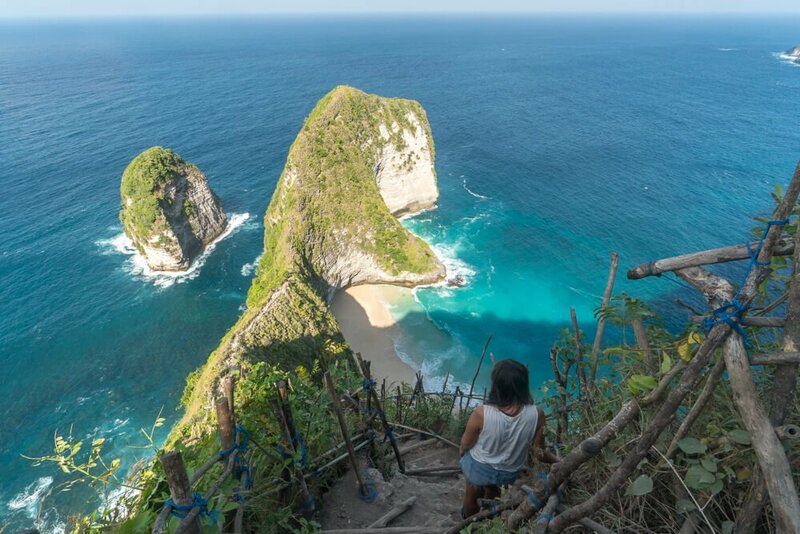 Thousand Island viewpoint is a brilliant spot to visit for views of cliffs along the coastline of Nusa Penida. Atuh beach is another pleasant spot to visit if you just want a more relaxing day. A taxi to visit these spots will cost around 600,000 Rupiah, but you may be able to negotiate to a better price. Once you’re done head to Penida Colada once again to enjoy dinner and some drinks on your last night. Make sure to book your ferry back to Sanur for the following morning and arrange a lift to the port through your accommodation. If you’re looking to find out more about this wonderful island then be sure to check out our Nusa Penida travel guide! Ramwan Guest House is ideal if you’re looking for budget accommodation in Nusa Penida. The property is located in Ped Village, just a short walk from a number of restaurants. Air conditioning is available at the property, although the cheaper rooms only come with a fan. Rooms start from as little as $11 USD (165,000 Rupiah) per night, with breakfast included. Click here to see the latest prices at Ramwan Guest House! Book a stay at the Govardhan Bungalow if you’re looking for a property with a swimming pool at a great price. Having a pool to cool off in can make a real difference on hot days, so it’s well worth the extra money. The staff at the property are super friendly and your booking includes a complimentary transfer to and from the ferry port. Rooms start at $35 USD (538,000 Rupiah), with breakfast included. The Semabu Hills Hotel is one of the best places to stay on the island thanks largely to the wonderful infinity pool with views of Mount Agung. The property is extremely luxurious and is also in a great location for watching both sunset and sunrise. Staff at the hotel are extremely helpful and so can assist booking any tours during your stay. Prices are extremely reasonable, starting at $60 USD (844,000 Rupiah) per night with breakfast included! Click here to see the latest prices at the amazing Semabu Hills Hotel! Although the Gili islands are technically part of Lombok, it’s well worth visiting them as part of your Bali itinerary. The 3 Gili islands all have something slightly different to offer, so it’s worth making a decision in advance as to which one suits you best. Gili Trawangan is the busiest of the 3 and has the best nightlife, restaurants and bars. Gili Meno is a lot more laid back and is less developed so is nice if you’d prefer a relaxing stay. Gili Air is more busy than Gili Meno but not as built up as Gili Trawangan. From Sanur the ferry to the Gili islands takes around 3 and a half to 4 hours. Make sure to allow enough time to change between ferries in case your ferry from Nusa Penida arrives in late. 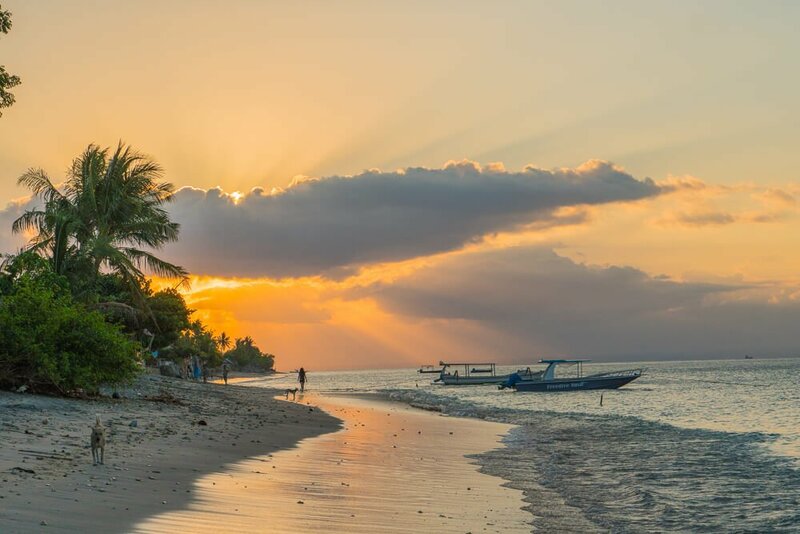 Click here to book a ferry from Sanur to any of the Gili islands! When you arrive at the Gili islands it may be tempting to take a horse carriage ride around the island or to your accommodation, but the horses are treated extremely badly. On average a horse should live to around 25-30 years old, but due to the way they’re treated on the Gili islands they typically only live 1-3 years. Whatever you do, please don’t fund this extreme animal cruelty. Click here to find out more. By the time you actually arrive it’s likely to be late afternoon/early evening. If you don’t arrive too late then treat yourself to a few drinks at a beach bar while enjoying a beautiful sunset. 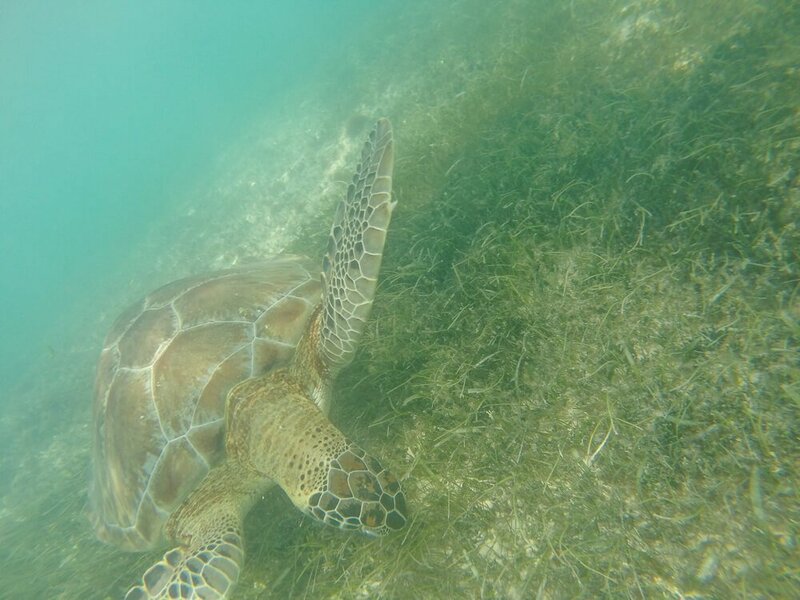 Make sure to book yourself onto a snorkelling tour for the following day before calling it a night. After breakfast the next day make your way to the meeting point for your snorkelling tour. Make sure to bring plenty of sun cream to make sure you’re well protected. No matter what island you’re staying on the snorkelling trip should visit the same spots. The Gili islands are home to some incredible marine life, and with some luck you should be able to see both green and hawksbill turtles as well as a wide range of colourful fish. Your tour should also take you to visit the impressive underwater statues of Gili Meno. This snorkelling trip is bound to be one of the highlights of your trip so savour every second of it! By the end of the trip you’re bound to be tired out from all that swimming, so the best thing to do is head for some drinks at the beach! You don’t need to get up early the next day so it’s a good chance to have as many cocktails or beers as you want without worrying about the next day being ruined! For your final day on the Gili islands take it nice and easy. If you’re lucky enough to be staying somewhere with a pool, make the most of relaxing poolside. Other options include heading to the beach, going snorkelling or enjoying some day drinking! It’s a good chance to have a more relaxing day in comparison to the rest of the itinerary! You’ll want to wake up early the next day to catch a ferry back to Sanur before heading to Canggu – the final stop of your Bali itinerary. One of the best mid-range options on Gili T is the Pearl of Trawangan Resort. The unique bamboo styling immediately makes the property stand out and gives it plenty of character. Complete with a beautiful pool and swim up bar, the Pearl of Trawangan Resort really is an amazing option if you’re looking for a relaxing stay. Rooms start at around $65 USD (1,000,000 Rupiah) per night. Click here to see the latest prices at the Pearl of Trawangan Resort for your dates! If you’re looking for luxury, look no further than the Kaleydo Villas. The highlights of the property is the beautiful pool located just outside the rooms. Staff at the property are extremely friendly and will help arrange tours for you during your stay. Rooms at the Kaleydo Villas start at around $100 USD (1,520,000 Rupiah) per night. Click here to see the latest prices at the Kaleydo Villas for your visit to Gili Trawangan! If you’re looking to stay on one of the quieter islands, Hotel Ombak Paradise is a brilliant mid-range option on Gili Air. The property has an absolutely massive pool complete with a poolside bar, perfect for when you just want to chill out! On top of that, the staff are extremely friendly and there are plenty of restaurant choices nearby. Rooms start from around $61 USD (930,000 Rupiah) per night. Click here to see the latest prices at Hotel Ombak Paradise on Gili Air! The Mahamaya Resort is perfect if you’re looking for a peaceful escape on Gili Meno. It’s a brilliant spot to rejuvenate by the pool or beach away from the crowds on Gili T. Staff at the resort are extremely helpful and the rooms are nice and comfortable too! Rooms start from around $144 USD (2,194,000 Rupiah) during the peak summer months, but if you’re lucky Agoda sometimes offer great discounts at other times of the year! Click here to see the latest prices at Mahamaya Resort on Gili Meno! After arriving back to Sanur you should arrange a taxi to take you to Canggu. If you have mobile data/wifi then your best bet is to try and order a Grab as this is generally cheaper. Alternatively you can negotiate with a driver near the port but they will try to charge more. You should expect to pay around 200,000 Rupiah for a taxi to Canggu, with the journey taking between 1 and 2 hours. As it can take around 4 hours on the ferry to Sanur, you won’t arrive into Canggu until fairly late in the afternoon. We recommend heading for dinner at Warung Bu Mi – a buffet style restaurant that serves great local food at an extremely good price. 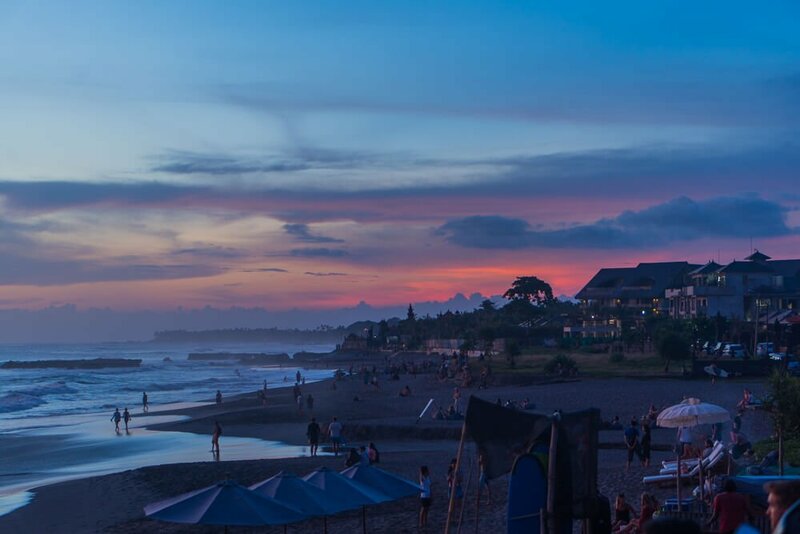 After you’ve eaten head towards the beach for drinks at the Lawn – one of the most popular bars in Canggu. The Lawn is in a great beachfront location, making it a brilliant spot for watching sunset. Unfortunately this means it can be quite busy, but fortunately there are plenty of other bars and restaurants along the beach if you’d prefer a quieter place to drink! The next day arrange a taxi to take you on a day trip around the South of Bali. There are some incredible places to visit, it’s just a matter of choosing what interests you the most. As you’d expect there’s plenty to choose from but some ideas of what to do include surfing at Uluwatu, trying watersports in Nusa Dua and relaxing on Dreamland beach or Melasti beach. One spot well worth visiting is the beautiful Uluwatu temple (Pura Luhur Uluwatu) perched on the edge of a cliff. The stunning location makes it a wonderful spot to visit for sunset on your last night. You may also want to visit the Tanah Lot temple – another beautiful place to watch sunset. The cost of a day trip will vary depending on where you choose to visit, but it’s likely to cost at least 600,000 Rupiah for a day trip from Canggu. As always, make sure to negotiate to get the best possible price. When you get back to Canggu head out for some drinks to make the most of your last night in Bali. The next day it may take over an hour to get to the airport if the traffic is bad, so make sure to leave in plenty of time to catch your flight. We recommend using Grab to get to the airport as local taxis are particularly expensive in Canggu. After spending 2 weeks in Bali and the Gili islands it’s time to make all of your friends jealous with pictures and stories from your trip! A great budget option in the Canggu area is the Kubudiuma Villas. The property has 2 swimming pools and is just a short walk from the beach, so you can have the best of both worlds! Although the villas are a little further from the main bars/restaurants in Canggu, they’re just a short bike/taxi ride away. Rooms at the property start from around $22 USD (335,000 Rupiah) per night, with breakfast included in the price. Click here to see the latest prices at the Kubudiuma Villas in Canggu! If you’re looking for a luxurious stay at a very affordable price then make sure to book one of Zoe’s Private Pool Villas. The villas are spacious, extremely comfortable and best of all come with their own private pool – so you’ll never have to worry about it being too crowded! It’s a bit further out from the main area of Canggu, but there are still plenty of restaurants nearby. Rooms start from around $65 USD (1,000,000 Rupiah) per night. Click here to take a look at prices for a stay at one of Zoe’s Private Pool Villas! For a truly unforgettable end to your trip, book a stay at the Tugu Bali Hotel. The suites are spacious, comfortable, beautifully decorated and some even come with their own private pool! Situated in a tranquil location, this boutique hotel is a truly wonderful place to relax. Rooms start from $490 USD (6,672,000 Rupiah) per night, with breakfast included in the price. Click here to see the latest prices at the Tugu Bali Hotel in Canggu! Like this 2 week Bali itinerary? Pin it!